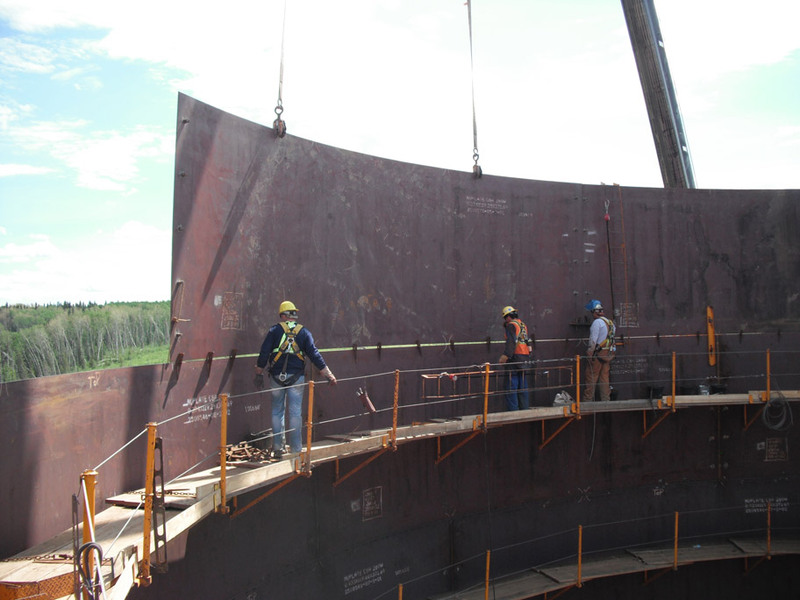 Field Erected Tank Construction - TIW Steel Platework Inc.
You don’t get to be the best in industry by sticking to your comfort zone. TIW is constantly striving to improve its processes and techniques in the field to ensure our customers are getting the best value. TIW has a wealth of knowledge and expertise from years of field experience. We continue to build on that knowledge to evolve to the new market conditions we face. TIW is currently taking on additional subcontractors and performing as a General Contractor on a number of projects. We are taking on more work and branching out to more industries than ever before. Our experienced in-house crews consist of field supervisors, inspectors, safety officers and project managers. These teams work in direct partnership with local union halls across the country. Using this model allows us to retain top talent and years of expertise, while reserving the ability to quickly scale our manpower to tackle small or large erection projects under highly challenging conditions. "We learn something new on every project we build, and we harness those lessons by incorporating the learnings into the next projects"
We have a reputation in the industry of being the only EPC tank contractor who can continually complete projects on time and on budget. We don’t believe in bad luck, we plan around it. Our project planning starts when we bid a project. At this stage TIW produces a highly detailed and manpower loaded schedule, but this is just the start of our planning. TIW will test our schedules before our boots hit the ground by comparing the WBS (Work Breakdown Structure) activities to years of relevant data we have collected. We learn something new on every project we build, and we harness those lessons by incorporating the data into the next projects. We look at geographical location, historical weather patterns, past project performance, other major projects in the area and client requirements to ensure our schedules are accurate and attainable. TIW’s proprietary Project Management System has reshaped the way we track and monitor projects on a daily basis. A cloud based approached to our project management means that the home office always has real time data, constantly being updated from the field. Unlike other companies, we openly share this data with our clients. We are proud of how well we perform in the field and we want to be able to show off those numbers. A detailed Project Management system is more than just progress tracking, it also needs to be agile enough to adapt to the changes in the work. That is why all our clients receive a detailed weekly report outlining the Change Requests and highlighting any upcoming issues we anticipate we may encounter. When you can anticipate the changes, it gives everyone time to plan for the best solution.